Who is your favorite writer that most people have never heard of? I LOVED Joseph Weisberg’s 10th Grade- so funny, poignant, and wonderful! Also, Laura Moriarty’s The Center of Everything, Lori Jakiela’s Miss New York has Everything, Joy Nicholson’s The Tribes of Palos Verdes, Elisabeth Robinson’s The True and Outstanding Adventures of the Hunt Sisters. . . I know there’s like a gazillion more, but that’s all I can think of at the moment! Anything by Judy Blume or Norma Klein could keep me tucked away and quiet for hours! I read Deenie so many times the cover fell off! But I kept it all these years- taped on cover and all! Are you there God? It’s me, Margaret, was passed to so many friends I eventually lost track of it. Go Ask Alice was the one we hid from our moms (even though I didn’t really have to since my mom never censored!). And reading Love is One of the Choices, French Postcards, and Forever made me feel so mature and grown up. And then of course, Catcher in the Rye--one of the few books they made us read in school that I’ve gone back and read many times since. Describe your ideal place to write. At home, in my office, with the door closed, the blinds drawn, the ringer silenced, the TV off, and a full pot of coffee by my side. Your life is a TV series. Name the theme song, one event that would be on the "best of" episode, and one that would be on the blooper reel. Everyday I Write The Book by Elvis Costello is definitely my theme song. My “Best Of” episode features the day when Jon Stewart calls to ask me if I’ll be a guest on The Daily Show, Bono adds me to his e-mail forwarding list, Oprah sends me a text msg telling me I’m her next book club pic, commercial and literary authors stop sniping long enough to hug it out, and all across the planet diseases are cured, the hungry are fed, poverty is erased, rainbows appear, birds chirp, animals frolic, and all are at peace. That day hasn’t actually happened yet, but I’m waiting. . .
My “Blooper Reel” shows the all too real clip of me, sitting at my desk, at 4:30 in the afternoon, in coffee stained pajamas, still not showered. Um, does spending over ten years clad in a head to toe, highly flammable, polyester ensemble, with plastic wings, support hose, little fake pearl earrings, and fugly pumps count? I traveled the world in that get up, working as a flight attendant for Delta Airlines! 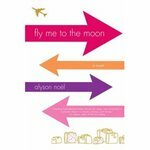 And I wrote a book about it called Fly Me to the Moon. Ah, that’s so sweet! Okay, let’s start with organic, free range turkey, a generous dollop of guacamole, a couple slices of melted manchego cheese, two stips of crispy, organic, free range, turkey bacon, a thick slice of tomato, and a whole grain bun. And if you could pile some fat fries on the side, and throw in an icy cold Arnold Palmer, I’ll be eternally grateful!